“Just sit right back and you’ll hear a tale….” And this week’s tale references television, theater, opera, novels, and alternative rock. Last week, we began a blog feature called the “Pop Culture/Theater History Reference of the Week.” We know that schools teach history, but we’re helping to make sure that kids catch our references to important pop culture and theater history too. There may be no greater combination of high dramatic art and lowbrow TV sitcom than the fourth episode of the third season of Gilligan’s Island. Thanks to cable stations like TV Land and others, the castaways of Gilligan’s Island have stayed on the air for generations. The original series ran from 1964 to 1967, and reruns aired frequently during afterschool hours in the 1970s and into the 80s. Three made-for-television movies were also filmed and aired in the late 70s and early 80s. In The Producer, that iconic episode from the final Gilligan season, a film producer played by Phil Silvers (that’s a link worth following too) crashes onto the island. Hoping to get a film role for Hollywood actress and castaway Ginger Grant, Gilligan and the others perform a musical version of William Shakespeare’s greatest tragedy, Hamlet. The music they set the Bard’s words to is from Carmen, based on an 1875 opera by George Bizet (which itself is based on a short novel written in 1845 by Prosper Mérimée). (For an even more off-the-wall reference and connection, NBYT Executive Director Darren Farrington was involved in a 1990s avant-garde musical called Carmen: The First Two Chapters written by Gordon Gano of the Violent Femmes. A mention of it is on the third page of this Los Angeles Times article about the alternative rock band.) Carmen‘s Habanera and The Toreador Song are two of the most famous arias in all of opera. And they were both used in the Gilligan’s Island Hamlet. The episode has been listed by TV Guide among the best television episodes of all time. So, this week is a three-for-one: Gilligan’s Island, Hamlet, and Carmen—plus a handful of related references. 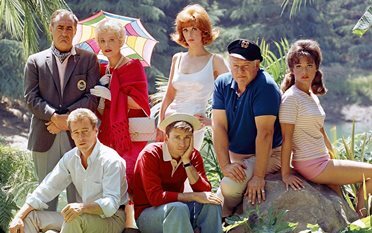 A few of the Gilligan’s Island cast also had careers on Broadway: Tina Louise, Alan Hale Jr., and Natalie Schafer (whose Broadway stage career from 1928 to 1959 was the most extensive of the cast members). A few of the other castaways, most notably Dawn Wells, had theater careers in regional and touring productions after their Gilligan’s Island fame. Previous Previous post: THE CINDERELLA PROJECT Ready for School Bookings!